Mythology of twins is one of the richest in world culture. There is also a specific category of conjoined twins in prehistoric art which usually has been interpreted as a result of artistic imaginary in combination with possible exotic myths. However the contemporary human culture shares the experience of conjoined twins, one of the most amazing examples of which are Abby and Brittany Hensen. Two-headed statuettes, designed by Lamia Salem el-Khoury. a. Double goddess after James Mellaart, Catal Hüyük, A Neolithic Town in Anatolia, McGraw-Hill, New York 1967, Pl. 70. b. 'Spectacle' idols, Tell Brak, after Seton Lloyd, The Archaeology of Mesopotamia, Thames and Hudson, 1978, fig. 46.
c. Two-headed idol from Cappadocia, Anatolia, after Pierre Amiet, The Art of the Ancient Near East, Harry N. Abrams, Inc. New York, 1977, p. 389: 455.
d. Plank Shaped idol of Red Polished Ware with two long necks and heads, From Dhenia, Cyprus, after Vassos Karageorghis, The Civilization of Prehistoric Cyprus, Ekdotike Athenon S.A., Athens, 1976, fig. 36. Abby and Brittany Hensen shows us that not only the goddesses, but also the human nature is gifted with strong superpower and positive energy. Probably in prehistory they would be treated like goddesses or witches. 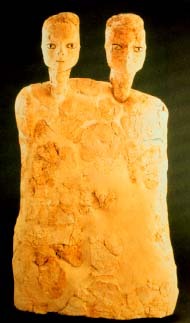 Although it is difficult to interpret prehistoric art in context of ordinary human everyday life, conjoined 'Ain Ghazal female twins and other examples from prehistoric Eurasia may stimulate evolutionary research to prove the conjoined twins are part of human evolution probably from the beginning of the human history. For now at least in art, Abby and Brittany Hensen have certain cultural-biological ancestry which goes at least 9 millennia years back. Bailey, D. W. (2005). Prehistoric figurines. London: Routledge. Lesure, R. G. (2011). Interpreting Ancient Figurines. Context, Comparison, and Prehistoric Art. Cambridge: Cambridge University Press. Orphanidis-Georgiadis, L. (online). 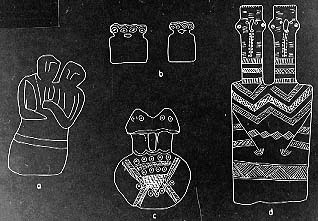 Introduction to Neolithic Figurine Art. Neolithic.gr. Schmandt-Besserat, D. (online). 'Ain Ghazal Monumental Figures: A Stylistic Analysis.Utexas.edu. August 10, 2012.